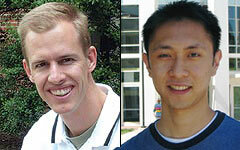 ECE Ph.D. students Kevin Galloway and Steve Tjoa have been awarded Graduate Student Summer Research Fellowships at the University of Maryland for the Summer 2008. This is the inaugural year for this Fellowship program, a companion program to the Flagship Fellowships and the Wylie Dissertation Fellowships. Summer Research Fellowships are intended to provide mid-career support to doctoral students at the period approximately before, during, or after achievement of candidacy. The Fellowships are intended to enable doctoral students to devote a summer of focused work to preparing for or completing a benchmark in their program's requirements. The specific goal of the program is to help doctoral students to take a significant step forward in their studies in a timely manner, to reduce time-to-degree, to increase degree completion, and to enhance the quality of the graduate student experience. The Fellowships carry a stipend of $5,000. Kevin Galloway is advised by Prof. P.S. Krishnaprasad (ECE/ISR), while Steve Tjoa is advised by Prof. K. J. Ray Liu (ECE/ISR).